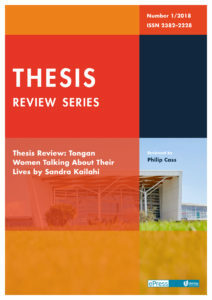 Sandra Kailahi’s thesis, Tongan Women Talking About Their Lives, explores Tongan women in Auckland fulfilling leadership roles. About 60,000 Tongans live in New Zealand, the third largest group coming from the Pacific islands but, in keeping with a general trend in New Zealand, very few Tongan women hold leadership roles; although there are some notable exceptions. Kailahi, herself a noted journalist and recognised figure in the Pasifika community, focuses on two main points: what leadership means to these women, and how gender and culture affects their leadership roles. Click here to read this review.